I was up at the peak of the Queen’s Domain almost a month ago on the 29th of March when I came across an odd looking grass right in the midst of flowering. While I don’t claim to know anywhere close to all the grass species in Tasmania, I am familiar with the gist of many of the genera. However, this specimen didn’t look like any grass genus in Tasmania that I could place a finger on. 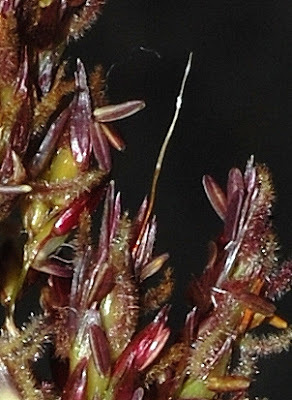 The closest thing the spikelets reminded me of was another weedy grass in the genus Paspalum but the structure of the inflorescence was totally wrong. I tried keying it out with the Curtis-Morris Student’s Flora Volume 5 to no avail. I needed the expertise of a master, which is when I deferred to maestro Greg Jordan. As I threw my hands up in surrender he whipped out his treasured tome – the $250 Flora of Victoria Vol. 2. We were going to consult this tome. Learning the nitty gritty of grasses can be quite an involved process, requiring an attention to inconspicuous and reading lines of esoteric sounding jargon for floral parts (e.g, glumes, lemmas, paleas, etc), but that really is part of the fun. Initially, our efforts at keying the species out seemed to go nowhere. We ended up at various other species which do not look one bit like our mystery plant. Then when we were about to give up Greg noticed an awn (a bristle-like appendage) sticking out from one of the spikelets. And then it was as if an embolism popped. While our mystery plant was slightly less adorned in the awns as it might normally be, it keyed out easily to Sorghum halepense (Johnson grass), an African native. I have seen Sorghum grasses before but I didn’t make the connection for this one as I had previously only seen Sorghum in a mature state, with their attractive voluptuous pearly seeds. Sorghum halepense is recorded in Victoria as a weed although at this stage I am not sure if it has spread beyond the Domain in Tasmania. There was just maybe one or two clumps of it and I reckoned that it hitchhiked on the tyres of an automobile (probably from mainland Australia). 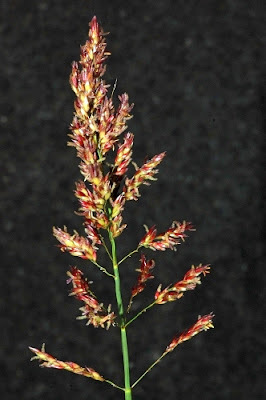 Weed or no, Sorghum halepense is a very attractive grass with panicles full of crimson-tinged spikelets and exquisitely bold feathery stigmas. I’ll be back again for a rendezvous with it next year. This entry was posted in Grasses, Introduced Plants and tagged Johnson grass, Poaceae, Queens Domain, Sorghum, Sorghum halepense, weeds. Bookmark the permalink.